Cons: I just bought this new SYBA SD-SA2PEX-1E1I PCI Express SATA II (3.0Gb/s) Controller Card, eSATA + SATA II PCI-e Controller Card, Sil3132 Chipset, Hot Plug, from NEWEGG and it arrived this date. Following the directions, I inserted it into PCIex1 slot, turned on the computer, and the card was NOT detected. Again it was not recognized as being in the computer. It, according to the accompanying literature, is compliant with the PCIe 1.0a specification. Also according to accompanying literature it is supposed to show up in device manager "Under the Storage Controllers category, Silicon Image SATALink controller". I get nothing, no bang no controller, no found device. After trying to install in a brand new HP Z230, I then tried to install it into a brand new HP Z220. Both were running Win 7 Pro. I ran into the same problem, it was not discovered, recognized or detected. I then tried to install the card into my HP DC7800 running windows 8.1. The computer and operating system detected the card as a Serial ATA Controller in device manager, but crashed with the BSOD. I did not load the drivers as It was never my intention to install the card into the older machine running Windows 8.1, I merely wanted to see if it would be detected. I bought it to install in to the Z230 to add a eSATA port without using one of the onboard SATA ports and an adapter. This card is brand new and I read the reviews before I bought it. Only one person said that it was not recognized (detected) on a Windows machine, one of his two machines, but said that it was detected on his i7 computers. I figured surely I will not have the same problem, but I did. The HP machines have gen 2 PCIe slots and I have been having problems getting them to recognize Gen 1 PCIe cards. The cost of returning them versus the refund make it not wort the cost. Do not buy this card if you have a new computer with Gen 2 or Gen 3 PCIe slots. Other Thoughts: This may be a pure HP problem. I spent 3600 buying two workstations and neither one will take a Gen 1 PCIe card. Perhaps the system needed to be updated before the cards will be recognized. Please feel free to contact us @ sybausa.com if you require further assistance. Pros: I have a diagnostic system I use for backups, imaging, and diagnosing hard drives. Until now I had been using the USB2.0 port on the dock but that had been way to slow. Plugged this in and started using the e-SATA port. Now things are very quick and I'm happy. This was installed in an old Dell Vostro that shipped with XP. Cons: Wish it had an internal SATA3 port so I could use an SSD as cache directory for my compression software. Cons: The card received is good and is recognized in another computer. Unfortunately, the system where it needs to work it is not recognized by the BIOS. This is apparently due to it being PCI v1 whereas newer systems only have v2 and v3. While a v2 card may work in a v1 slot, a v1 card does not work in a v2 slot. Symptoms: not listed in lspci, no BIOS screen during POST, and on checking, not listed by BIOS at all. Other Thoughts: three eggs because it appears to work as advertised when installed on older hardware, but does not work at all on newer systems. Tested on Dell Precision T5600, originally with A03 BIOS, then updated to A09 with no change(which turned out to at least partially break the Perc with linux kernel 3.8, but that is a different story). This product still should be able to function in a PCIe v2 and v3 slot. Perhaps the motherboard BIOS/Fireware needed to be updated. Our engineers will look into this matter. If it is a problem with our production design, we will improve it. We are more than happy to provide all of our customers with a prompt exchange whenever a product becomes defective. Other Thoughts: Bought this to add an external eSATA and internal SATA to my new Lenovo win 8 Box with Intel Z75 chipset- it was not seen by BIOS or WIN 8 in either of the 2 PCIE slots. Moved it to my old Win 7 Quad core desktop. Win 7 found it and installed drivers, says it is working correctly, but will not connect to any SATA device I try. Gave up-, not worth sending back. You are very close to using this product properly. The last step is to initailize the Disks you connected using Disk Management utility. contact our Support team to walk you through the installation process at support@sybausa.com. Making affordable quality products is our goal. Our engineers will look into this matter. If it is a problem of our production design, we will improve it. Pros: This is exactly what I needed, just 1 e-sata and 1 internal sata, I am running a Western Digital Black e-sata 1tb drive, and a internal sata bluray burner from the card, all in Windows XP Pro....Installed the drivers from the disc, on restart both drives are recognzied. I get over 100/meg sec on the hard drive, and bluray burner all burn fine without issue. Really a cheap great investment. Other Thoughts: For me does NOT lock up on Windows XP Pro, like some others have said, I have had zero issues with it for months now. For the money it can't be beat. 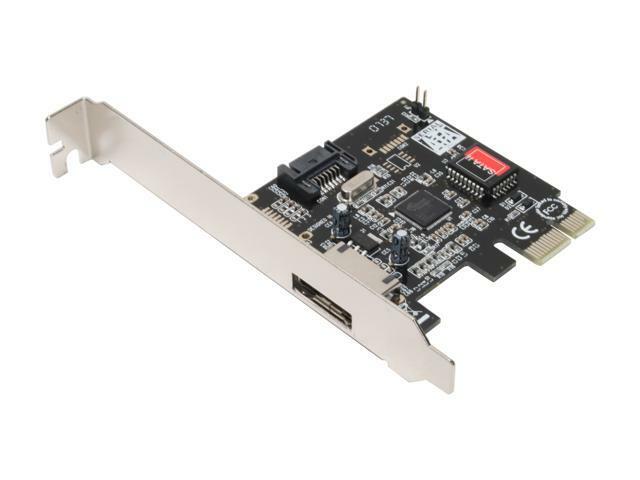 Other Thoughts: Beware that it has only 1 internal SATA port, but if that's good enough for you, this is a very nice little card for a good price. The manual says you need Windows installed but you can even install Windows 7 (I did 64 bit) with this card as the only controller. You have to load the driver during install, the included disc contains the latest Windows 7 drivers. There is a pitfall though, after you tell Windows the partition etc it says "cant install on this HD", but you have to replace the driver disc with the Windows disc at this point and click the partition again and it installs. Comments: I will probably get another to put in my 'Junk Box' for temp use in setups, it's cheap enough.